We live in a world where you need to create new passwords regularly. Some of them are for unimportant things (where your money or identity isn’t at risk), and for those, you are free to use a weaker password because it will be a lot less hassle. However, there are times when you need to create a really strong password to protect your important information. Here are three simple steps to creating a strong password. Passwords must be eight characters or longer. No excuses. Combine letters, numbers, and other keyboard symbols but stay away from sequences (such as 12345678 or abcdefgh or qwertyui). If there’s a pattern involved, then there’s also a weakness! Also steer clear of passwords where you substitute similar-looking symbols for characters (such as p@55w0rd; hackers know all these tricks). The more random a password, the better. Don’t use your name, birthday, anniversary, or any words from the dictionary. You’re wasting your time even putting these passwords in place. They make it way too easy for the bad guys to get at your stuff. Remember, a weak password is effective only against an honest person. We serve customers worldwide and we take in consideration the variation of requirements and needs. 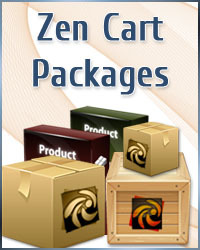 All the Zen Cart "Built Your Way" Packages include the latest Zen Cart version installation. Zen Cart is a free world-wide known open source system for managing eCommerce (online stores). We create and develop professionally designed Zen Cart stores that are extremely user friendly, cross browsers compatible, and ready to start generating content upon delivery. There is no changes to core functionality nor to the default database, so any future upgrade is easy and painless. Every one is different. We have created these packages based on everyday requests. That does not mean we can't develop your idea, it just means we have to quote it. If you believe that any of these packages won't suit your dreamed shopping cart, please contact us for a customized Zen Cart quote that will bring your idea to reality. Keep in mind that the more customized you want your cart, the more budget you will need. - Add your logo to your admin area so it prints on packing slips/invoices. - Other template features included. Every one is different. We have created these packages based on everyday requests. That does not mean we cannot develop your idea, it just means we have to quote it. Zen Cart is an excellent way to start an eCommerce site.